This topic is intended to nail down the look of all the different cities, and the varying styles of the towns and villages across the region. Not only the architecture itself, but what the cities consist of. Markets, shipping, guilds and so on. http://uesp.net/wiki/Lore:Pocket_Guide_to_the_Empire,_1st_Edition/High_Rock wrote: Although the Bretons are divided into numerous mutually antagonistic factions, to the outsider a singular uniformity in dress, architecture, and customs prevails throughout the land. Once predominately a Nordic city, but was assimilated by the Bretons over time. Founded by the River Horse Bretons, after the Bjoulsae trade was opened up thanks to the suppression of the Orcs. http://uesp.net/wiki/Lore:Pocket_Guide_to_the_Empire,_1st_Edition/High_Rock wrote: Their villages are pleasant collections of half-timbered structures of one or two stories, with the rustic inn, a shop or two, and perhaps a lordly manor completing the picture. 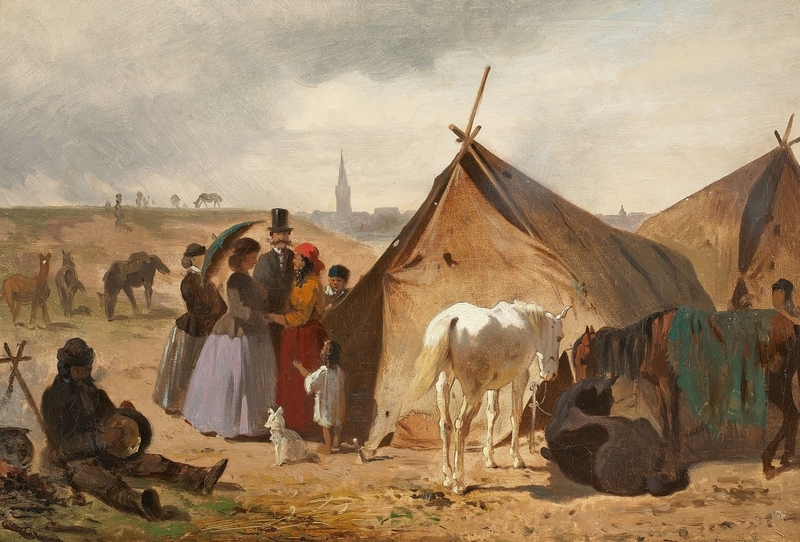 The traveler need not visit more than a handful of Breton communities before satisfying himself that he has captured the flavor of the whole. The High Rock 427 forums feel bare and I don't know if there is a plan for anything behind the scenes. I'm just posting this because I was looking at pictures of Wayrest from Daggerfall and it got me thinking. So here it goes. The city grew more from trade as opposed to conquest so I imagine the city would be somewhat less fortified than say Daggerfall or Evermore. The castle is more of a palace as shown in TES2, and it reminded me of Nymphenburg in terms of aesthetics. There are fairly spacious grounds depicted around it and I would expect to see some rose gardens hence the name Knights of the Rose. As the most populous and richest city in High Rock, the upper class district would be fairly large compared to other cities, and using the same general style as the castle for the upper class housing would be nice. Elysana is more cunning and prone to backhanded schemes. Therefore the look and feel of the city should be nice and pleasant on the surface, but less so once you scratch the surface. Wayrest doesn’t need to appear to have as much strength as Daggerfall, because the alliance with Orsinium provides more than enough for that. That’s not to say the city isn’t strong or defensible though. It’s the “Jewel of the Bay” and should look as such, not like a garrisoned fortress. Trade is what gave them strength, and that should be the focus. I do believe the city should have walls but they should look nicer, as well as be functional. Not like the vanilla Imperial forts at all. Daggerfall has always felt to me like the quintessential medieval city. If ever there was a Camelot or King Arthur in TES, then in my mind that would be Daggerfall. It has just always given me that vibe. Others might disagree, but that’s just the feeling I get. Daggerfall is more militaristic than Wayrest and should feel as such. The walls and gates would appear to be better-suited defensively than those of their rival Wayrest. The castle should appear more fort-like and it is shown in TES2 as having a moat around it. The city was founded by Nords and I would imagine that any of the longer lasting buildings would show some Nordic influences that have been overcome by Breton influences. It is described as having four city gates, one for each cardinal direction King Gothryd has control here and the general consensus around the bay is that his marriage is very strained and many think Aubk-i married him against her will (regardless of their true feelings to each other). With Wayrest’s alliance to Orsinium and Elysana’s cunning, combined with the bubbling tensions with Sentinal, Daggerfall should be the most militarized and combat ready city of Western High Rock. Therefore the look and feel of the city should be rather fortified, guard heavy, and have a decent-sized garrison. The city should have walls but they should look well maintained and nicer, compared to your average legion fort. The middle class should be the largest presence here as opposed to the upper-class heavy Wayrest. Nova Orsinium has been rebuilt through the strong and determined leadership of Gortwog. Unlike the traditional depiction and stereotype of orcs in the game, he is very intelligent and cunning. While the orc kingdom stood alone, they were isolated and only recently beginning to gain respect from the other kingdoms. Gortwog’s alliance with Wayrest however has now made them each a force to be reckoned with throughout the Iliac Bay and the rest of High Rock. Wayrest is a center of trade and wealth and Orsinium backs them up with appropriate military might. Orcs being a strong and warrior heavy race, the city should be quite militarized. Orc citizens who are not part of it should look up to Gortwog’s orcish legion and consider them heroes for trying to further their goal of making Orsinium a greater kingdom. The city itself is described as being made of iron, so having a very “forged” feel to it would add to that effect. I also read that it is built both on and into the side of a mountain. So I imagine there will definitely be some exterior buildings, but you could have lesser interiors just cut out of the mountain with nothing but a door placed into the side of the rock. Due to the alliance, I think a small presence by some Wayrest emissaries or some Knights of the Rose should be allowed to live in the city. No Imperial guilds should make an appearance in the city as it is still too hostile (note that I don’t mean overtly violent though) for any outsiders to make any kind of foothold in the city. There are fewer shops than the other major Breton cities. Maybe not even one of each type, forcing the player to go elsewhere for specific services they need such as a bookseller. There should be at least one general store and various smiths and armorers though. One major feature of the city is its fortification. The entire settlement should feel like a self-sustaining fortress. The main focus of the city is the Stronghold of Orsinium, essentially the city’s castle. It is large, imposing, and should dominate the city in the same way Ald-Skar dominated Ald-Ruhn. Here is where Gortwog (and probably family) as well as his political advisors would be housed. Political guests from Wayrest would also be allowed to stay in a room or two here, begrudgingly so for the orc guards. There was a description of Emperor Uriel Septim beginning to consider Orsinium being recognized as a separate province, so an empire official should be located in the stronghold and Gortwog’s goal is to impress them and give them a good impression to send back to the empire in the hopes it will convince them to finalize that idea. That being so, the orc citizens still have great dislike for non-orcs. Therefore, the combination of all these opinions and the fortress-like appearance should give the player a weird sense of passive hostility upon entering the city for the first time. The orcs only tolerate the Wayrest citizens staying there because Gortwog requires them to and they trust in him. I know it mainly showed up in TES5 but orcish armor is said to be made up of a combination of orichalcum and iron. Orsinium is said to be located on “Black Mountain” at this time, and orichalcum could be the cause of that name. Therefore I think a large mine should be located either within or right outside the city for raw orichalcum, with an iron mine nearby. Having these types of mines prevalent throughout the Wrothgarian Mountains would be a plus. Given that Orsinium was rebuilt on land nearby the previous ruins, I think a set of Old Orsinium ruins would be a nice touch. Throughout the city are various statues to orc heroes such as Mauloch, Torug gro-Igron, and maybe even Gortwog himself, among others. Gortwog has also been trying to reestablish a cult of Trinimac as opposed to Malacath which many outside Orsinium consider heresy. So a shrine to Trinimac rather than Malacath should take place as the central religious aspect of the city, with Trinimac deified and Malacath demonized. Those outside the city would still consider this a point of contention, showing their dislike of Gortwog’s ideals. Not much is known of Farrun. Mainly just that it is a port city known for icy winters. So Farrun sounds like it could be a “cold” version of a Breton city. 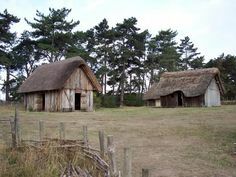 As if Breton culture were transplanted onto Skyrim geography such as tundra or glaciers or more likely taiga forest. I envision it as a large city, being the regional power and one of the major ports on the top of the continent along with Northpoint, Solitude, Winterhold and Windhelm. The image that came to mind is that of the Breton nobles trying to forge their way for their civilized culture into the hostile and barbaric territory of The Reach. For that reason I imagine the noble upper class using the same architecture set as Northpoint, and the middle and lower classes using the Western Reach tile set as Jehanna would use. I’m hoping that when used together they would provide a more striking clash visually to show the difference between the Western High Rock and Eastern High Rock cultures. This is something that I feel would be tough to pull off in the game without it looking odd. Given the proximity to Skyrim and the coast, some slight Nordic influences would fit here as well. Just as Daggerfall, Farrun would be the military power of its region. With resistance to Skyrim’s influence waning in Jehanna combined with the continuous strife caused by the reachmen, Farrun considers itself the probable next target for Skyrim’s expansion. I read through the link to the old SHotN thread briefly, where they discussed Jehanna, and I liked some of the ideas but took it in a slightly different direction. Rather than Evermor conquering Farrun, I pictured Evermor focusing its attention west while Farrun was locked in a cold war with Skyrim and with Jehanna caught in the middle. Just as Daggerfall and Wayrest are rivals, Farrun’s antagonist is the Western Reach in general. A set of Imperial guilds should appear in the city. The Mages/Fighters Guild halls should be the main halls for those guilds in this corner of High Rock given how far this city is from the provincial capital. A shop of every kind should be made available here as the next large city that would fill the same need (Evermor) would be roughly the distance of Ald-Ruhn to Pelagiad away. Along with good sized docks, I am picturing the bones of a large whale or sea creature lying on the coast of the city, showing that the fishermen don’t just catch tiny things, they bring home the big fish from the Sea of Ghosts. The surrounding areas would be forested or mountainous, and that would provide a logging industry for Western High Rock. So combine lucrative lumber mills and fishing docks with a few farms and mines, and you have a fairly self-sustaining city that’s looking to both defend itself from, and civilize, those barbarian reachmen and heathen Nords. I hope this is what you were looking for in this thread. Feedback perhaps? Last edited by Jet133 on Sat Feb 28, 2015 4:35 am, edited 2 times in total. Apologies Jet123. I completely missed your post. Been a bit busy lately. There has been talk of stuff related to development of the mod previously. A lot of it just hasn't been discussed yet or re-entered into the new forum. I really like your write up for Wayrest. It is most definitely what we are after for the thread. Again, apologies I didn't notice this sooner. Hope it doesn't discourage you cos we could really do with more of this. Could also do with some real world examples to use as inspiration or references for the individual cities. The original plan was to make 3-4 architectural styles at most for the entire region. Excluding Orsinium and other specific tile-sets. No worries. Thanks for the response. I edited my previous post and added Daggerfall and Camlorn. I had those done and never got around to posting them. I had also started on Shornhelm and Orsinium but I didn't get those done. Maybe I can finish those up soon. I never read any of the old forums so I don't know of any planning that had been done or if any of my thoughts or ideas conflict with previous ones. So sorry if that's the case at all. Also, I know SHotN is making Dragonstar, but are they making Jehanna and Elinhir as well? Or is Jehanna part of High Rock 427? I did have a few province wide ideas/suggestions though. Cemeteries and crypts were big in TES2 so I figured they would be here as well. At least compared to vanilla Morrowind. So having other assets to add cemeteries to settlements both large and small would be nice. Such as gravestones, etc. These might take up the gameplay role ancestral tombs played in Vvardenfell and mainland Morrowind. I would like to see arenas in the major cities. Not necessarily huge ones that dominate the landscape or anything, but a presence. It would be interesting. I know few would agree with that though. I know that makes 6-7 sets if you don't plan on re-using the shacks/huts from vanilla or seeing if you can borrow from SHotN for the reach-style buildings, but this was just the assumption I was operating under. Also, the orc camp set was just an idea. It would have taken the same gameplay role that the ashlanders had on Vvardenfell but applied it to exiled orcs in the mountains. Thanks for reading all this though. Definitely want to hear some feedback. I can't remember why SHotN were making Dragonstar. But as far as I'm concerned, Jehanna is most definitely in High Rock. So will be included in this mod. We were basically going along the same lines for cemeteries and crypts as you have suggested. So they will most definitely have their own tileset. Same goes for witch covens out in the wilds. As well as smugglers den's and Orc camps in the mountains. As for arenas present within the cities. I had thought about that in the past. I think it would definitely be a cool feature. However I don't think they should exist in every city. When I said 3-4 tile sets I was only referring to the major cities. The idea was that the cities nearest each other would share the same tile set. Orsinium would obviously be unique. Each city would have a unique Castle, but those that share the same tile set, will have a castle built in the same style. Awesome work on the write ups once again. Would you mind if I merged them with the first post and added yours into collapsible spoilers just to tidy the place up a bit? By all means, go for it. These posts can get quite large. If you want to make any corrections or expansions while you're at it, go ahead. The way I see it, you guys are the real modders and I'm just a lurker throwing out ideas to be accepted or discarded at a whim. I'll still probably add more cities when I get around to finishing them. I may have to fire up TES2 again to get a general feel for Orsinium as for some reason, it was never that memorable for me. As for Dragonstar, I thought it was because Skyrim technically owned it during this time period as well as Jehanna and Elinhir thanks to the War of the Bend'r Mahk. I didn't know if they had claimed Jehanna to work on. I'm also basing my city sizes on the "Tier" method that TR, P:C, and SHotN are using. It just works so well. I'll probably include my proposed list of those sizes at some point. I think my idea for the number of architecture sets was very similar to yours. Just to clarify, I was assuming that all the settlements would be using the same regional set, but only the largest cities in each region would get special pieces. Such as Wayrest. For instance, if White Haven was included I thought it would be using the same set as the middle/upper class would for Shornhelm and Northpoint, just without any special or unique pieces. I had four regions set up aligning with the same cities you did, so that worked wonderfully. The lower class I figured would be very low, like the shacks in Hla Oad or Gnaar Mok. The middle and upper classes I imagine being like those pics posted of the common tile set, but one in each of the four different regional styles. Also, is there a development map or anything like that? A map of settlement locations or regions that matches the heightmap that's been developed? I can't seem to find one anywhere. Tier method? First I've heard of it. There isn't a map on the forums yet. But I do have some laying around. I will try and get the map uploaded later. There was a small discussion about Jehenna on the old old forums. I can't find it there, but luckily I copied it to the old SHotN forums because it was relevant to Skyrim-High Rock relations. Link. SGMonkey wrote: Tier method? First I've heard of it. The tier method at P:C and SHotN. Can't find the thread at TR right now. Basically, it's a method to keep a sense of settlement hierarchy and get a clear view on the population density in different regions. It's also useful to assign services and faction representation to cities, and to keep a cap on the number of interior claims: without these guidelines, cities tend to become disproportionately large in relation to their importance. I updated my first post and added Nova Orsinium and Farrun as well as putting spoiler tags on the majority of the text. Thoughts on the order of things or the updated city list? It's so similar to our Direnni style... interesting Although I admit I've always envisioned the Tower quite differntly myself. A tall and massive structure, not gentle at all, in fact a raw adamantine cuboid, coalescing with nearby surroundings, warping and muzzling reality around it. Hi Under . I still have unfinished model somewhere, if i'm not mistaken . berry wrote: It's so similar to our Direnni style... interesting Although I admit I've always envisioned the Tower quite differntly myself. A tall and massive structure, not gentle at all, in fact a raw adamantine cuboid, coalescing with nearby surroundings, warping and muzzling reality around it. Funny, I have the exact same picture in my mind. The main thing I would like to stress in terms of Architecture is that many places contain a large magical presence. As the masters of Alteration and Mysticism, magic that they use for their benefit, I would like to see a variety of magical architecture among those who study in magic. Enchantments that make their buildings float off the ground, with floating glowing crystals and the like, even in major cities. I don't think it'd be very uncommon for their to be floating shelves in stores in some cities or to see daedra slaves walking the streets doing deeds for their masters. Hmm. I wouldn't agree on floating buildings and such. For this kind of magical artifice, it's important to keep a sense of relative scale. The stopping of the meteor above Vivec is a good point of comparison: this is explicitly an act of a god, impossible (or very difficult) for normal mages to replicate. We see very little (or no) floating architecture anywhere in lore or in the gameworld. I agree that the commonality of magic should be stressed in Bretony, but not in this blatant fashion. Daggerfall: The Bretons of Daggerfall are obsessed with their history, a fact which is reflected in their buildings. While most post-Septim buildings follow the architectural cues of the Imperial Province, the foundation of the city is the original construction of the First Empire of Skyrim, massive stone halls adorned with depictions of eagle, snake, and dragon and the archaic runes of their kings. Occupation of one of these ruins is a status symbol in the city, and while the merchant and knightly classes keep their homes maintained by mundane construction, the mageocracy revel in enhancing and reinforcing the dilapidation of their great keeps by magical means, and as such it is common to see walls shattered from artillery bombardments but frozen upright, towers whose crumbling tops float several feet above their bases, and great iron doors whose locks and hinges were long ago smashed or rusted away but which stand more secure than the vaults of the Imperial Palace itself. Wayrest: Though younger than their cousins in Daggerfall, and no less willing to partake in the material pleasures afforded by their mercantile dominance, it is in the Bretons of Wayrest that we find the true sons and daughters of Galen. 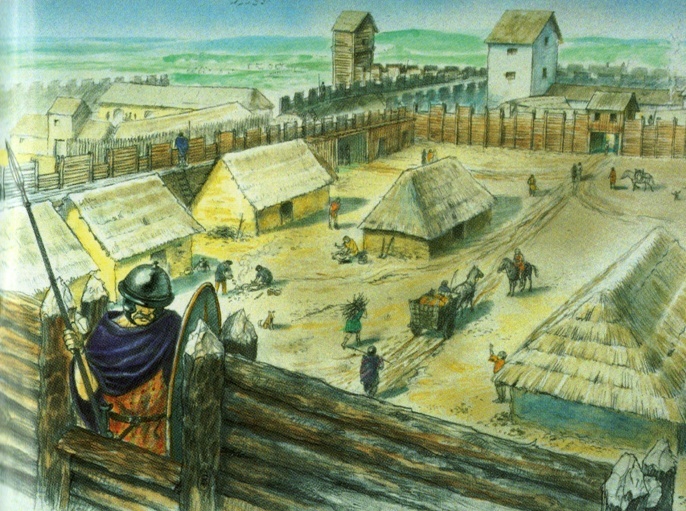 Here does the druidic tradition flourish and find new life in every corner: the looming hedge walls that guard the city, buttressed by traditional timber palisades and bristling with foot-long spikes of bronze; the bramble-manors of the lesser nobility, the wood frames of the lower and middle class abodes replaced by a latticework of enchanted vines holding the earthen walls in place; the manicured garden estates of the mageocrats, white plaster walls supported by the trunks of living oak saplings whose branches create their graceful arches and spires and whose thick foliage shelters the open roofs of these homes. Moss and ivy grow in abundance in the damp climate, shooting up over the ground and between the cobblestones of the main roads, and over the walls of the city’s buildings, and in many spots it can be difficult to see where the ground ends and a house begins. Shornhelm: Built in the imposing shadow of the Crypt of Hearts, it is perhaps no surprise that the Bretons of Shornhelm are given toward morbidity, often bordering on the maudlin. Black banners hang from every balcony, adorned with the scowling visages of bygone kings, and worn reliefs of ghosts, wraiths, and skeletons perform a grotesque march around the stark facades of the city’s buildings. Its twisting spires, while a pale imitation of the Crypt, are on their own a most impressive sight, as is the Black Tree around which the palace complex is built, a gnarled ruin of an oak in which the city’s rulers are interred, to be reborn as undying witch-kings who will rule their kingdom for centuries at a time before they are finally exorcised by their successors. Bjoulsae Horse-Folk: In contrast to the magical splendor of High Rock’s urban areas, the region’s Nedic remnants lead a simple, austere lifestyle, and prefer it that way. Their crannogs and pier-villages, made of mud and reeds and woad paint depicting ancient sigils and devices, crowd the mud flats at the mouth of the Bjoulsae River and the wild regions to the west. Wool tartan scarves flap in the breeze from atop wood stakes denoting the borders of each tribe’s territory; this always includes dozens of acres of grazeland for their prized horses, which can be a major source of contention among the tribes, as well as with the civilized kingdoms of High Rock who similarly covet the fertile plains north of the Bjoulsae. It seems like there is a really strong old-school kingdom vibe coming from that, which I personally don't particularly agree with. For the main thing, you say that the Bretons "are obsessed with their history," PGE1 clearly states the exact opposite. 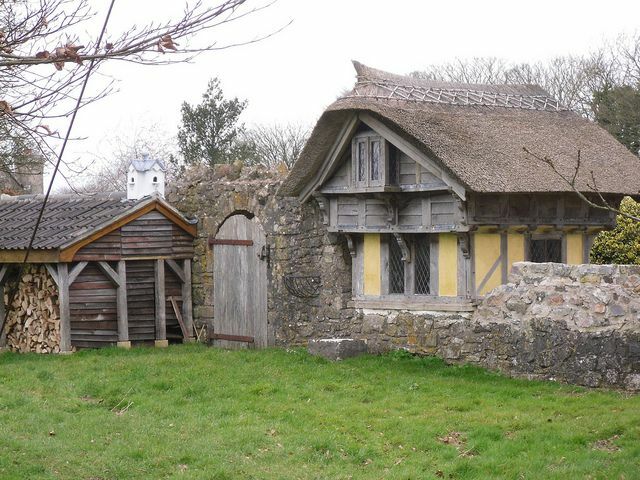 That Bretons are "unsentimental about their history" and that "few buildings of any age survive." This nearly clearly states that they are constantly rebuilding and improving their buildings and cities, not keeping old ones. I do agree, however, that they could magically reinforce structures. I believe it should look magically refined and unique to any other buildings across Tamriel, being made by the masters of Alteration and Mysticism in the entire world. My apologies if I sounded rude! It's a very interesting and thoughtful piece, I did not mean to offend in any way - just to point something out. No worries, I wasn't offended It was a fair catch on your part lol. Bjoulsae tents image dump. Did a google search for some inspiration. I figured we should try to do something a bit different than yurts, as 1. That's what you expect from Nomadic horsepeoples, and only makes them more generic. 2. 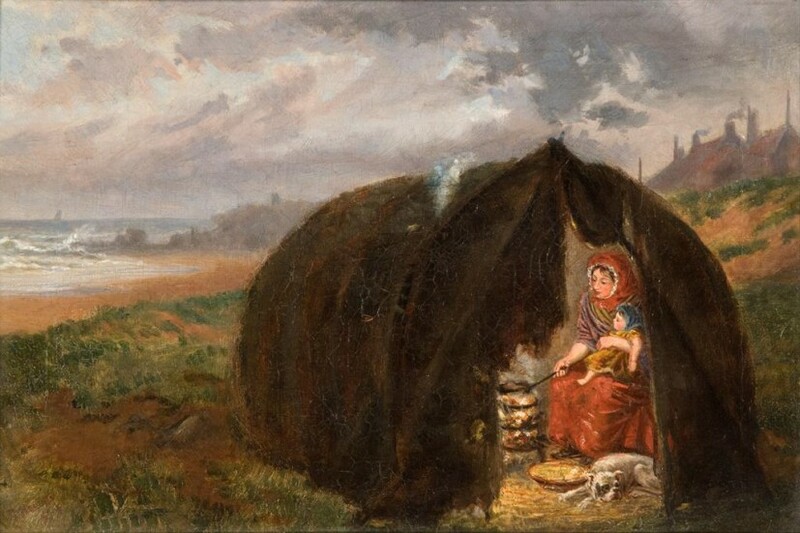 Nomadic Orcs and Ashlanders already use yurts. The main inspiration IMO should be Scythians rather than Mongolians. In relation to that, we can have leather-scale armor coupled with the more furlike armor shown in the PGE concept art. 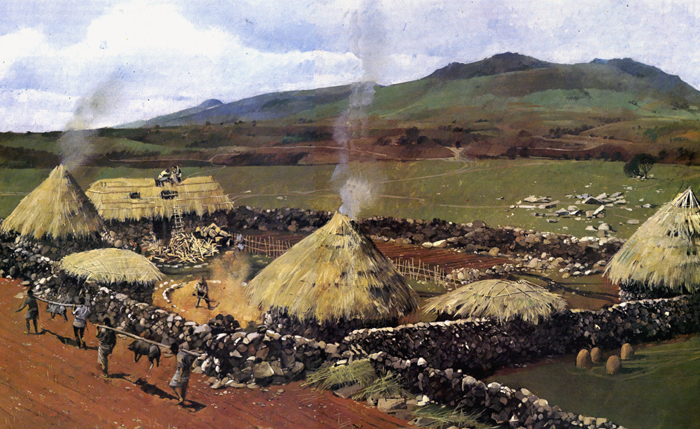 Other good sources of inspiration are Celts, Gauls in particular. Especially when it comes to naming. The Bjoulsae river tribes are closely related to Reachmen, so there should be a lot of similarities between the two in culture and style. I think a rectangular tent, made from hide or canvas would work here. Like the Orc Nomad set, they should be customisable with various adornments, like pelts, horse bones and skulls, clan flags, windows etc. We also need to think what materials are available to the Bjoulsae. I'm thinking primarily hide from horses and other beasts, pelts from small mammals like otters, wicker from river reeds, bone, wood, stone and clay from the river. The constructions needs to be movable, as the Bjoulsae move around with their horse herds. 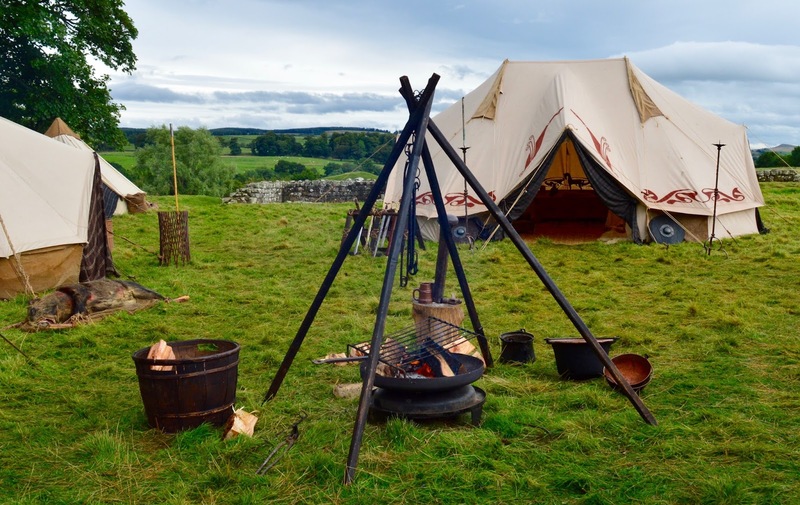 As a Nomadic people, they shouldn't practise metallurgy, but steel and iron weapons should be common enough, as they are trading with their neighbours and are known as ferocious mercenaries. 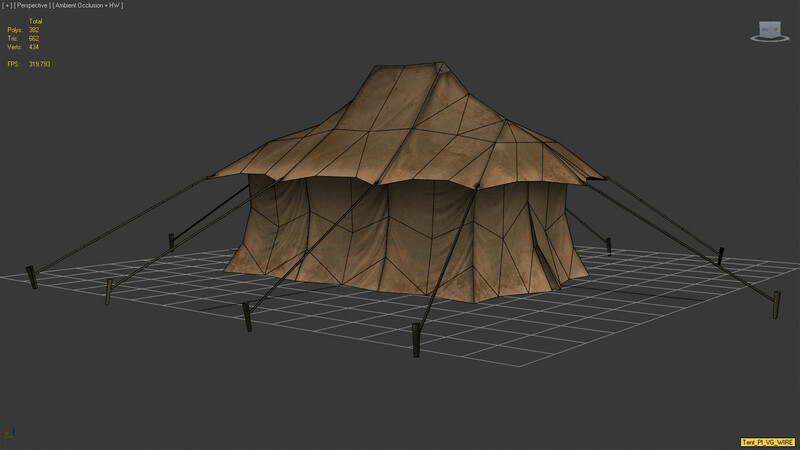 1-2 variations of small tents. The camps would primarily be made up of these. 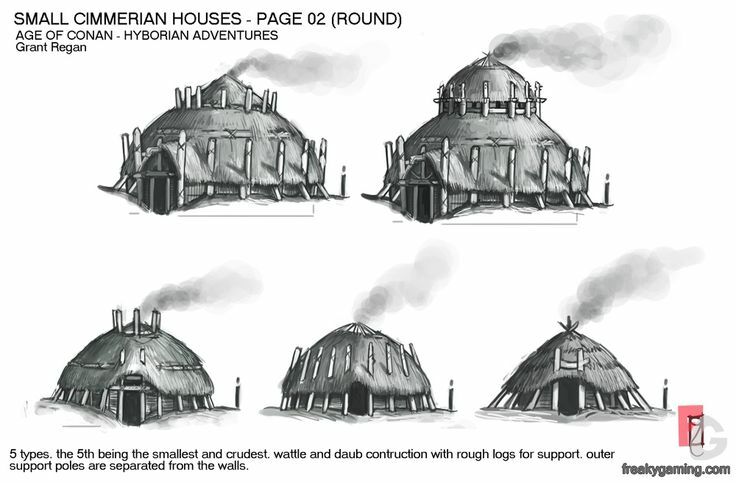 These should be similar in size to the small Reachman hut in Tamriel Data. These should be rectangular or vaguely tipi-like. 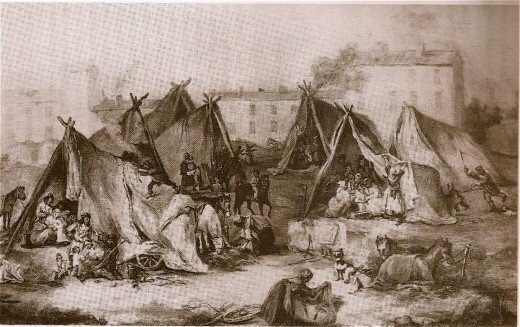 1 larger tent, with ornamental paintings on the side. For communal use or warlord/chieftain. This can be more yurt like, and either square, rectanglish or circular. 1 large open tent, like a pavillion. 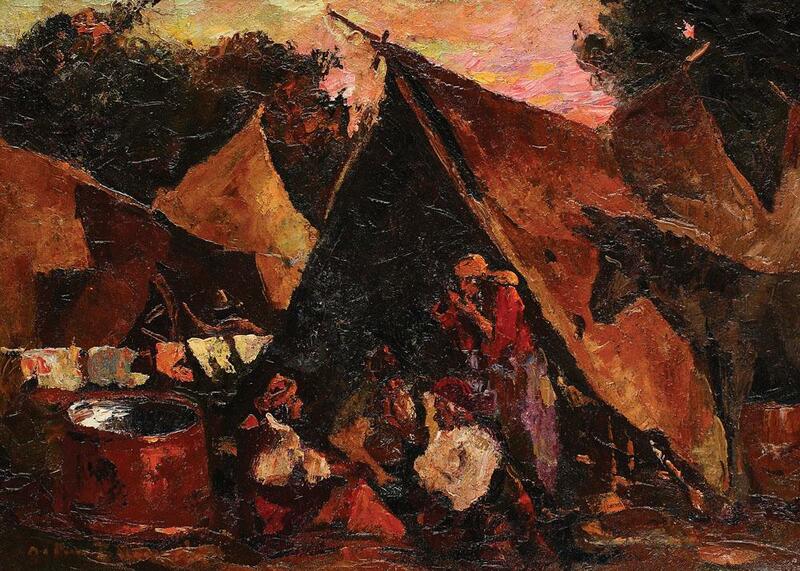 A communal gathering and storing place, where food is prepared and eaten, craftsmen work sheltered from the sun, etc. 1 small shelter type construction (lean-to). For storage primarily.